I had such fun slowing down to make this card. I was so rushed during the Saturday’s Stamp-a-Faire though it was very fun. I took my time and just when I thought I was done, I added something else and I am THRILLED with it! The challenge was to use the colours shown below in the inspiration photo. I only had the green and coral colours so I had to hunt to find this yellow paper that fortunately had both yellows in it! YEAH! I tried to use the rule of threes on this but I don’t have three yellows. I debated adding a yellow button somewhere but decided against it because I couldn’t becide where to put it. Maybe in the white space to the left of the sentiments? Hmm… I’d love to hear your thoughts on the issue! I did make a small mistake; I am fairly new to PTI card stock. I grabbed a scrap of green for the leaves and the panel under the lace. When I put away the rest of the scrap and one other, I realized they were different, the one I used was darker. Ooops! I had used Ripe Avocado instead of chartreuse. Bummer! Too late to change it now. I also used this month’s SFYTT on this card but I basically cut off the bottom so it would be a landscape design instead of portrait. Interesting how some sketches are thrown off my altering them but others are still awesome! If you enjoyed this card, I hope you will visit again. I have subscription thingies on my sidebar. 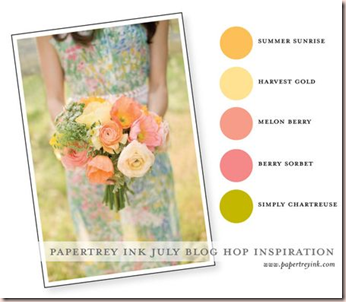 Have fun on the rest of the blog hop! Great projects and great blog! This is a beautiful card and I love the flowers…your pearl and lace border looks amazing! This is a lovely card. Those flowers are gorgeous. Beautiful card. The rule of 3 drove me crazy! Your card is perfect the way it is. Absolutely beautiful! Love all the pretty details! Oh such romance. I love this card. 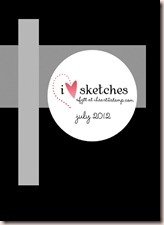 Love your card and I'd leave it w/o the button. I love the vintage feel too! gorgeous card — love the lace and the pearl accents…completely my style! so many details on this card – everything aobut it is lovely! Beautiful! 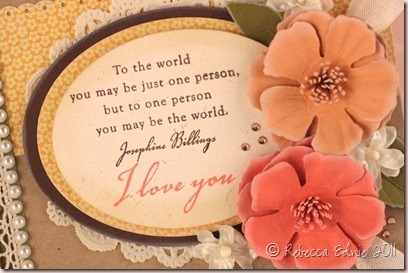 I love those flowers and the different colors used on the sentiment. I didn't even notice the different colored leaves! Wow, that is beautiful! I love the vintage feel and soft edges. I don't think it needs a thing Rebecca! I like the rule of three, but I also don't think we need to be tied to it all the time~ just my thought. Love your card! 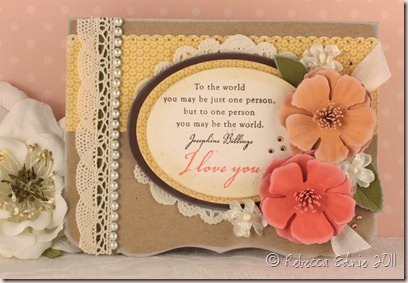 It's so pretty and the way you stamped the two sentiments is just delightful and perfect! Beautiful card! !